Auricular Therapy Advanced Seminar – Nader Soliman, M.D. This seminar reviews the basic inverted fetus presentation and then takes the participants to the evolution of Paul Nogier’s discovery of the more advanced three-phase system. Participants will learn the auricular somatotopic presentation of phase 2, and learn how the three embryological tissues are presented onto the ear in this phase. This phase presents organs and structures that have suffered from chronic constructive lesions, such as osteoarthritis, rheumatoid arthritis, liver cirrhosis, cancerous lesions, etc. Participants will practice Point localizations of organs and structures projected in phase 2. Participants will learn the auricular homunculus of Organs and structures projected onto the ear in phase 3. These are organs and structures that have suffered from chronic pathology without tissue distraction. Participants will learn that exact localizations of the projection sites of the organs and structures in phase 3 and practice the localization these points. Participants would practice various treatments of both phase 2 and phase 3 localizations using needles, electricity, laser, seeds, beads, and magnets. Participants will study the dynamics of the three phases of Paul Nogier and the identification of the pathology in one or more of these phases. Participants will get acquainted with the strategies of diagnosing different energetic and pathological problems in all three phases. Since the auricular acupuncture microsystem allows Direct evaluation of the brain organs and structures, extensive review of the physiological functions of that various Brain structures Will be discussed. Pathological afflictions of these brain structures and their symptomatology Will be extensively discussed. Participants Will learn how to use this three-phase system to effectively trade some of the most difficult medical problems. Participants Will learn how to use a three-phase system to treat functional medical problems, hormonal medical problems, and psycho emotional problems. Participants would have extensive studies on how to utilize the three-phase system interesting medical condition such as pain, addiction, obesity, and fertility, allergies. Psycho emotional problems such as depression, bipolar disorders, schizophrenia, anxiety, Panic attacks, and post dramatic stress syndrome Will be discussed and participants will practice treatment of these conditions using variable available tools. Participants will use the three-phase system to diagnose and treat Learning disabilities such as ADD, ADHD, stuttering, dyslexia, among others and learn how to use Needles, electrical stimulation, laser therapy, beads, seeds, and magnets to Address these problems. Following this week and course, participants would you be able to incorporate the three phase system into their practices giving them wider options of treatment and better outcomes. Finally, participants would be introduced to the final evolution of the auricular thank you for your microsystem known as auricular medicine. 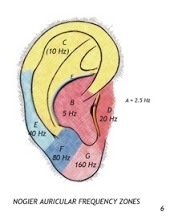 Discussion of the basic differences with simple and the three phase auricular System Will prepare participants to incorporating this unique approach in their practices.